Engineer, fabricate and commission a fully integrated sample conditioning panel for fuels blending optimization. 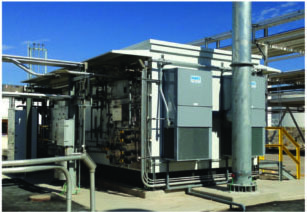 Panel included independent sample conditioning systems for six new optimization analyzers, including sample regulation and distribution, redundant filtration, stream switching, flow control, communications and panel lighting. Xenon was also contracted to provide overall system design consulting services, overseeing the entire project. Design and install a Xenon Safety System to monitor existing hazardous gas sensors in the HF Alky unit. System is designed to report alarm events to the AQMD per the district’s format and requirements. Project scope was to design & build a replacement for an obsolete CEMS and ancillary equipment. Project included: Integrated analyzer shelter w/ HVAC and hazardous gas detection, NOx, CO, O2 analyzers, data recorder for RECLAIM compliance, CEMS PLC w/ HMI, sample conditioning including sample pumps, condenser, calibration SOVs, heated sample bundle and sample probe. A Standardized fuels blending system with process and analyzer control systems controlled by a Tri‐GP Triconex controller subsystems include: automated redundant sample pumps, automated filter bypass system, analyzer sample conditioning and validation systems, Manual Sample Capture System, Sample Compositor, RVP, FTIR, Sulfur analyzers, Xenon Shelter Safety System and Xenon Liquid Recovery System.